Because when it comes to quality beef from pasture, this breed wrote the book. Galloway introduce a five century heritage of producing exquisite beef from pasture alone into the grassfed beef equation. These hardy beasts originated in the unrelenting and sparse region of Scotland known as the Southern Uplands. They sport a double winter hair coat that keeps them foraging and gaining in all but the harshest of winter weather, making them an energy efficient choice as well. But by far their best known attribute is their gourmet meat, it being fine-grained, tender and juicy, with a taste that is distinctive indeed. Taste panels in the U.S. and abroad have shown Galloway beef will rank at or near the top of the charts when consumers have a vote on the qualities that most impact their eating experience: Tenderness, flavor, marbling and juiciness. You won't just love Galloway for their exquisite meat, either. 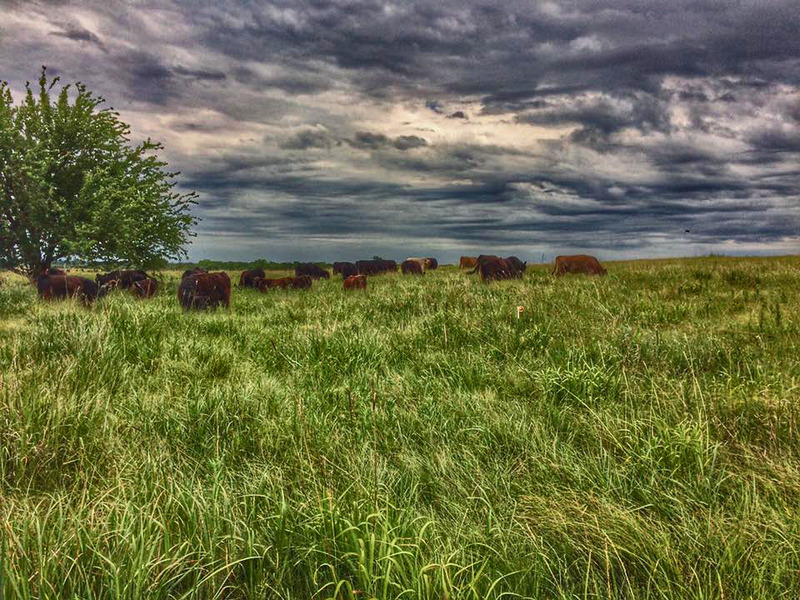 As you look around and compare prices grassfed beef prices in the eastern third of the state of Kansas, you will find the majority of producers are charging significantly more for their product. Why is this? We can't speak to their expenses, but we know the environmentally friendly grazing habits of the ancient Galloway breed reduce our costs significantly, and we pass those savings on to you. Its a win-win-win scenario! The environment wins, you win, and we win! And while the beef industry has continued its steady push toward bigger, faster growing beef animals, our grassfed Galloway beef gives you the rare opportunity to experience beef at a whole other level: Slow grown on a healthy diet of fresh forages and then dry aged for that Old World ambiance that's sure to make special meals, well, extra special! Only two (breeds) have "remained pure and unaltered by the introduction of outside blood: The Galloway and the Scotch Highland." The authors further state that, at five centuries, the Galloway is the oldest of the British cattle breeds. You'll want to know that our grassfed Galloway cattle receive no hormone implants, animal by-products or subtherapuetic antibiotics. A healthy production model yields healthy animals, giving us all a highly nutritious meat option.